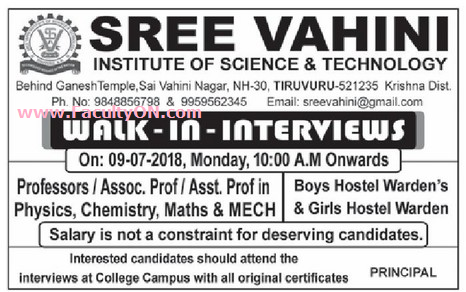 Sree Vahini Institute of Science and Technology, Krishna has advertised in the EENADU newspaper for recruitment of Professor / Associate Professor / Assistant Professor Plus Non-Faculty jobs vacancies. Interested and eligible job aspirants are requested to walk-in on 09th July 2018. Check out further more details below. About College: Sree Vahini Institute of Science & Technology registered under Kolli Ramaiah Educational Society has been established with a moto of giving quality technical education to rural youth. The college has built up with excellent infrastructure. The 10 acres sprawling campus with lush green environment is located at TIRUVURU by pass road, 80kms away from Vijayawada, Krishna Dist. How to Apply: Interested candidates are requested to attend the Walk-in interview by bringing their CV along with all originals & copies of certificates and recent PP size photo to the walk-in address provided below.